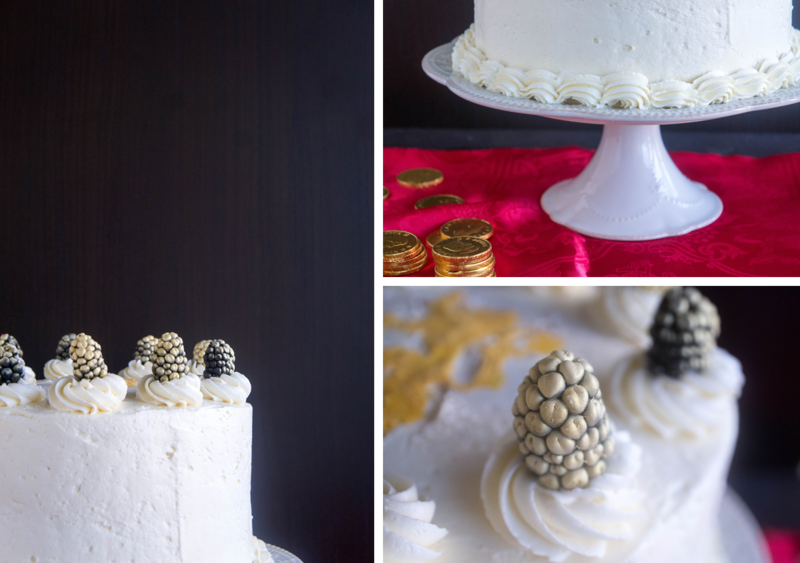 The second in my series of cakes dedicated to the main houses of Game of Thrones. See my Stark Family cake here. The Lannisters have definitely made their mark in the Game of Thrones series, more often than not, in a negative way. They are some of the characters I love to hate the most, especially Joffrey. Cersei is a close second. Ruthless and power hungry, they will do anything to rule and protect themselves and their secrets. They’re not all bad though. Tyrion is one of my favourite characters, with his intelligence, his wit, and his sarcasm. And even Jaime has his moments as his intense arrogance is tempered with imprisonment and the loss of his sword hand. The Lannisters always pay their debts. 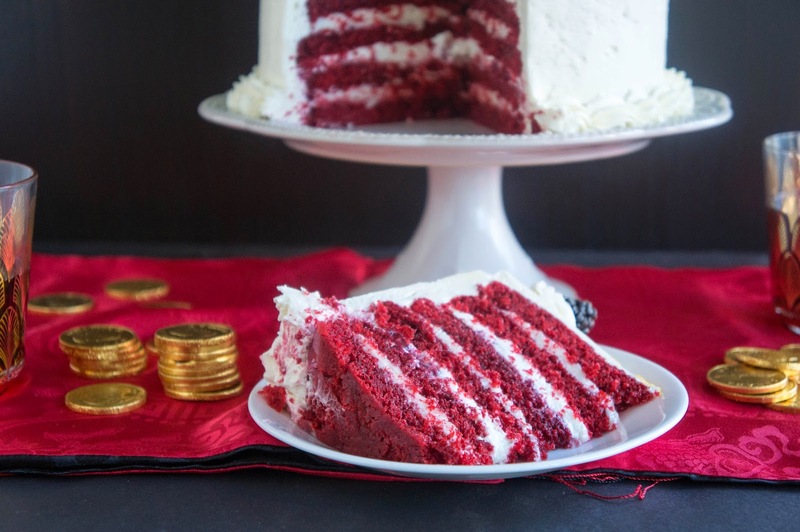 The cake: A red velvet cake with raspberry compote, cream cheese filling, whipped mascarpone filling, and fluffy vanilla frosting. 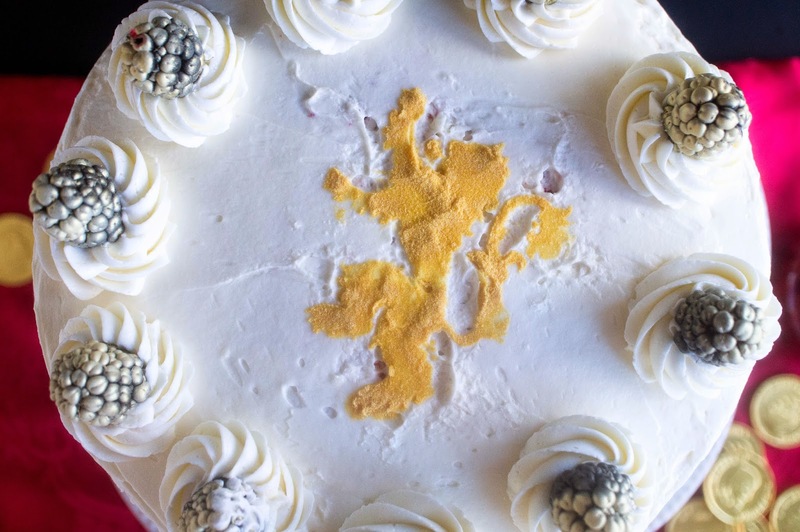 The outside of this cake looks very proper, clean, decorated perfectly, because, for the Lannisters, appearances are everything. They need to look the part of a Royal Family, no matter what is going on inside. Their sigil of the gold lion lies sparkling on top. 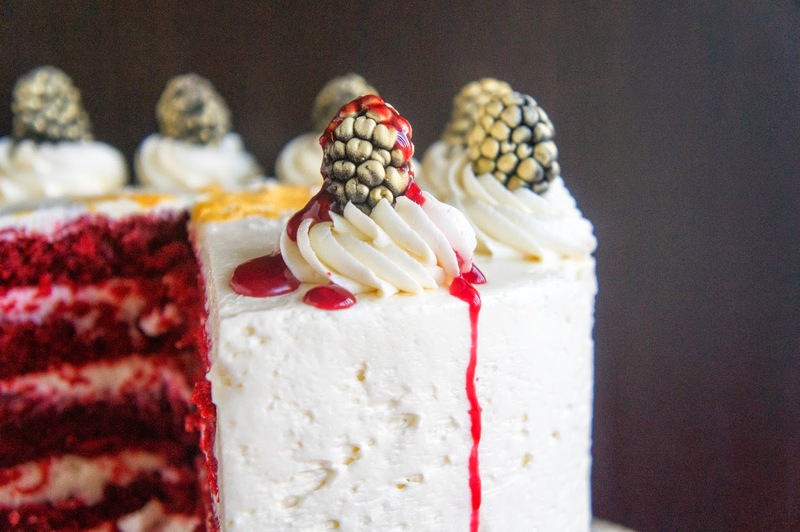 But when you slice into this cake, it is red, like the Lannister colours, but also the red of passion, brutality, anger: everything that they are hiding underneath their pretty robes. 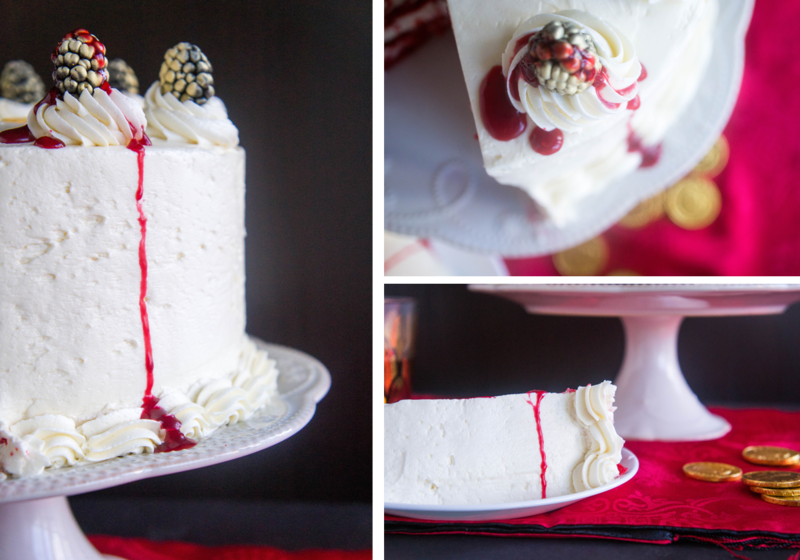 The raspberry compote drips out of every slice for all the blood the Lannisters are responsible for spilling. “Explain to me why it is more noble to kill ten thousand men in the field than a dozen at dinner.” – Tywin Lannister. I used this recipe exactly, but baked it in 3, 7” pans to obtain a smaller, taller cake. I used this recipe exactly. 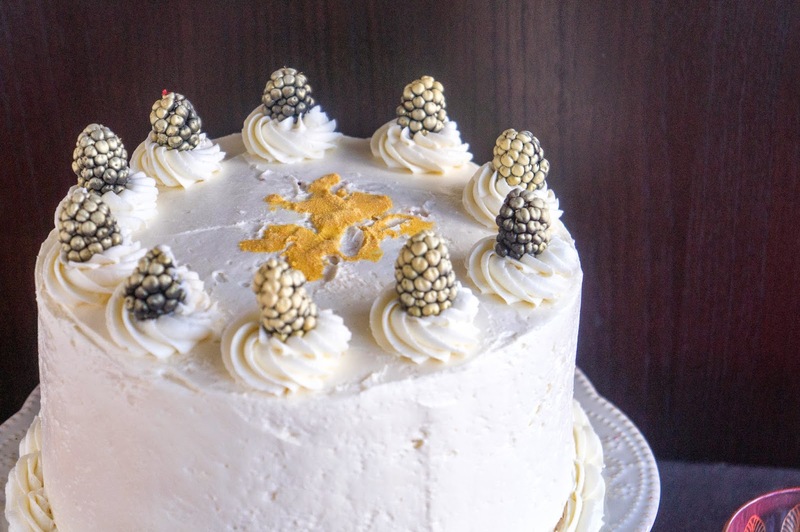 It makes too much for this cake, but I’m sure you can figure out other uses for the leftovers. Put it on any fruit tart or pie, or just use it to top fresh fruit. In a small saucepan combine 1 cup fresh raspberries, sugar, and lemon juice. Heat until berries start to break down, crushing them a little. Continue to cook the berries over medium heat until the liquid is thick enough to coat the back of a spoon. Strain the berries from the thickened juice using a fine mesh strainer. Stir in the remaining half cup of whole fresh raspberries, making sure not to crush them too much or this will cause your compote to thin. In the bowl of a stand mixer fitted with a paddle attachment or with a hand mixer, blend butter until smooth. Add icing sugar and mix at medium low speed until just combined. This is to coat the sugar in fat to prevent it from drawing the water out of the cheese and giving you a soupy mess. Add the cream cheese cubes and blend on medium speed until combined and smooth, about 2 minutes. Add vanilla and salt and beat again to combine. Do not overbeat! I used this recipe exactly, but needed two batches of it to frost my cake. Have your cooled cake layers ready and cut each one in half horizontally to yield 6 thinner layers. For all the layers with raspberry compote, I piped a dam of vanilla frosting about 2 cm from the edge, all around the outside of the layer using a piping bag fitted with a large round tip. Spread a little of the compote inside the dam, then top with whipped mascarpone filling to cover the compote. Hopefully, when you put the next cake layer on top, the dam will hold the compote in. 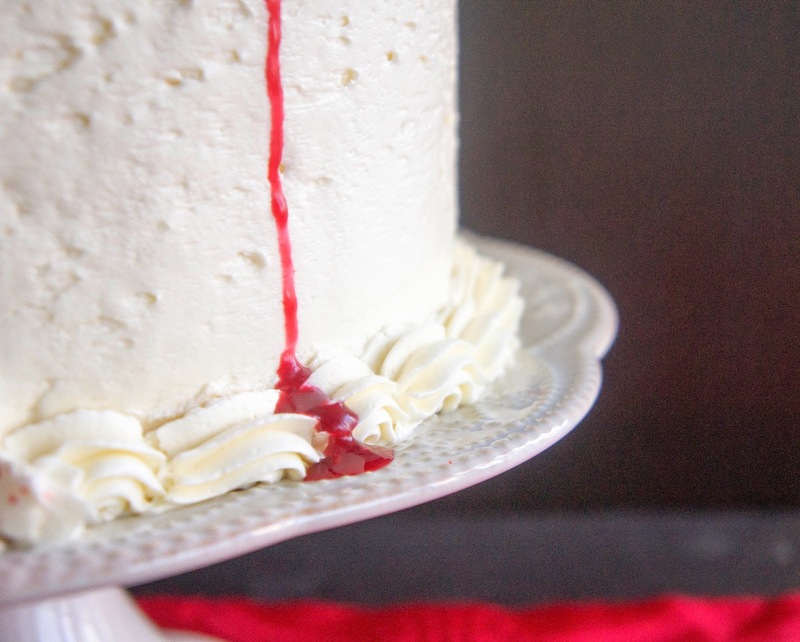 A leaky cake is very hard to frost. I frosted the entire cake with the whipped vanilla frosting. First spread a thin layer of frosting covering the entirety of the cake to fill in all the gaps between the cake layers. Then add more frosting to achieve a smooth look. 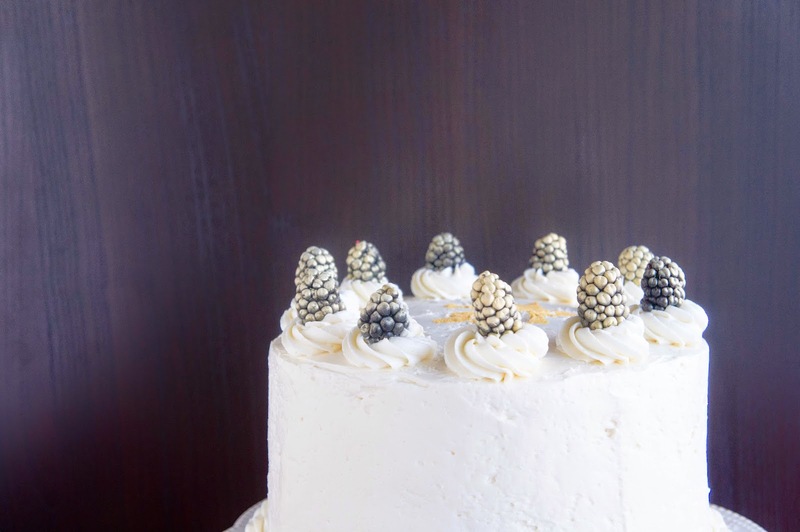 If your cake is very unstable (it happens with the whipped fillings), try refrigerating for a while after the first coat of frosting. I smooth out my frosting using a hot, dry cake spatula. To heat the spatula, just run under hot water for a while. For best smoothing, try to spread in an uninterrupted motion. Each time you remove the spatula, rinse and dry it again. The golden lion was made using a handmade paper stencil that I stuck down to the frosting. I then covered the whole surface with Wilton gold pearl dust and carefully lifted the stencil off. Frosting decorations were done with the fluffy vanilla frosting and a Wilton 2C tip.